Make her feel like the Princess of her own space with this elegant design. Two-color design lets you coordinate nicely with your existing palette. 3 size options let you get just the right size to fit any space. Arrives as a single piece that can easily be applied to your wall in minutes. Every girl is a princess. 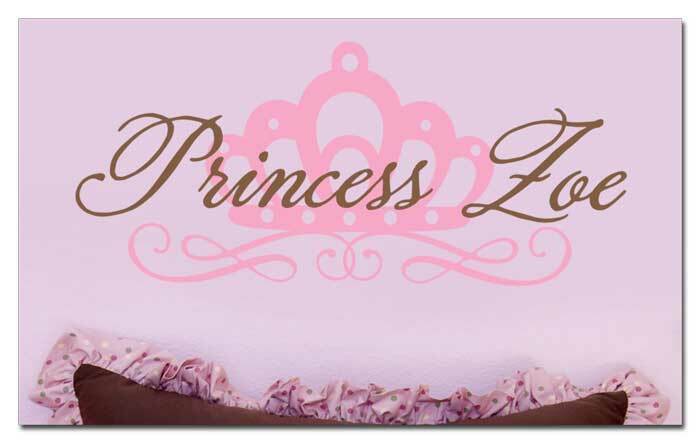 At DecorativeLettering we have just the right thing to help your little girl see that she is truly a valuable person. 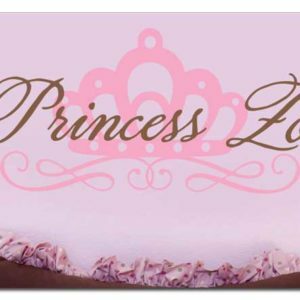 The ‘Princess name room’ wall decals are suitable for your little girl’s bedroom. The photo shows a sample of what we have available. The chocolate brown wall letters and the pink carnation crown are a breathtaking sight! These wall words will look great on any wall focal point in the room: above a headboard, between sconces, next to a lamp shade, window or wardrobe. Waking up to this amazing visual display will do wonders to your daughter’s self esteem! Ordering is pretty easy. Choose the colors you want for her name and crown. We have three size options to make sure that you get the right fit for your wall space. Use the previewer to confirm you have made the right choices. Applying will be equally simple. Remove the underlying paper and paste the sticky side of the wall lettering to the wall. They come as a single piece so you will have your wall quotes up in a few minutes! Our wall letters are affordable, low on maintenance, elegant and durable. They will not be affected by extreme heat or cold and will therefore look as good as new every day of the year! 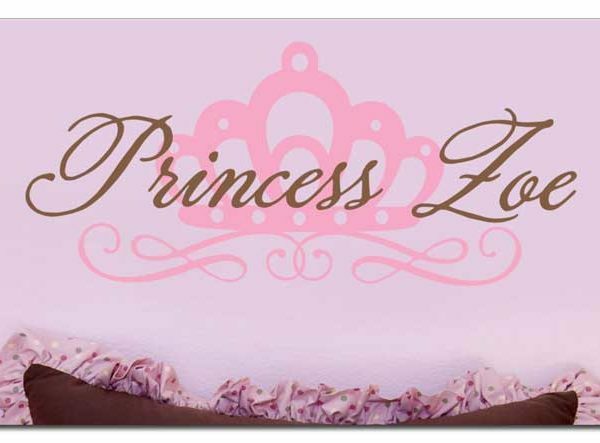 Are you looking for wall decor that will make your daughter feel like a princess? Try wall words from DecorativeLettering.